CNC Software, Inc., developers of Mastercam CAD/CAM software, announced that Harvey Tool and Helical Solutions' tool libraries are now available to Mastercam users on Mastercam's Tech Exchange site. These libraries contain all the end mill options that can be found in Harvey Tool and Helical Solutions most recent catalogs, totaling to more than 15,000 tools now available for Mastercam users to import. 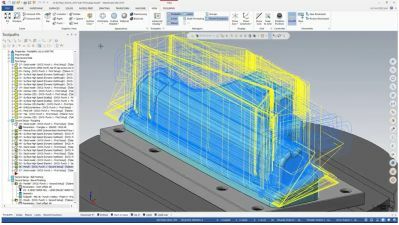 Readily available, comprehensive tool libraries translate into increased productivity for Mastercam users. Importing accurate tool libraries vetted by both Mastercam and manufacturers directly into the software saves the machinist valuable time. Without these libraries, machinists would need to look up a tool in a manufacturer's catalog and manually build the tool in Mastercam. Now, Mastercam users can download the Harvey Tool and Helical Solutions tool libraries to have those tools immediately available in Mastercam. Users that take advantage of this feature can program confidently due to accurate tool dimensions and tool data optimized in partnership with Harvey Tool and Helical Solutions specifically for Mastercam. The balance of the Harvey Tool and Helical Solutions tool libraries, which will include Harvey Tool's Specialty Profile cutting tools, Holemaking and Threading tools, and Helical Solutions' chamfer mills, are under construction and will be released soon. "We partnered with Helical and Harvey Tool because their tools are well respected in the manufacturing industry and are of very good quality," says Rich Taft, Product Owner, CNC Software, Inc. "We look forward to working with them to get their whole library up and running on our Tech Exchange, as they have some specialty form tools that will be great for our customers." Jeff Rauseo, Senior Marketing Specialist - Strategic Partnerships & Applications, Harvey Performance Company, comments, "Mastercam's industry-leading CAM software has been a long-standing, highly regarded leader in the industry by our end users for many years, so we are excited to partner with them to make these new tool libraries available."